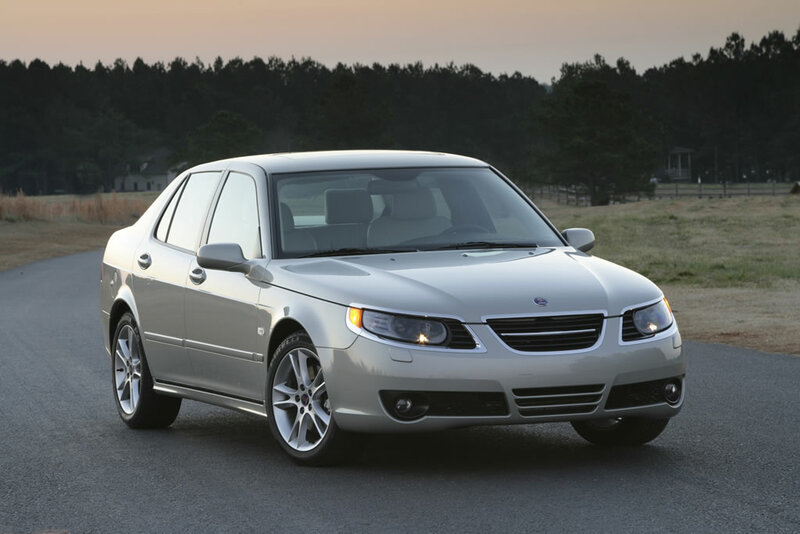 Saab’s 2006 9-5 lineup continues to offer luxury, responsiveness and excellent value in the midsize performance car category. For 2006, the 9-5 undergoes a thorough refresh that includes exterior sheet metal, enhancements to the chassis and powertrain and new instrumentation and “infotainment” systems. The Linear, Arc and Aero models will be merged in to a single model – the 2.3T – in sedan and wagon body styles. The SportWagon is now called the SportCombi. The new Saab 9-5 Sedan and SportCombi range is designed to reinforce the brand’s core appeal among discerning customers who seek a distinctive product in keeping with their own, more self-expressive values. Typically, such customers are independent-minded professionals who prioritize good aesthetic and original design that offers strong styling, performance and safety. With an average annual household income exceeding $120,000, market research shows that the proportion of Saab 9-5 owners with a university education far exceeds the average for the segment. The Saab 9-5 series has already established a strong, worldwide following and Saab expects the new range to attract more new customers to the brand. In Sweden , which has already established a supply infrastructure for E85 fuel, 45 per cent of all 9-5 customers are expected to opt for the performance and ecological benefits of the innovative 2.0t BioPower engine. Extensive re-tuning of the suspension and steering gives the new Saab 9-5 range enhanced chassis dynamics to match its sporty new looks. Reduced body movement and more immediate responses to driver inputs have been achieved without compromising the excellent ride quality. The 9-5’s core suspension and chassis layout was an excellent starting point, benefiting from isolated front and rear sub-frames, de-coupled MacPherson strut front suspension, an independent, multi-link system at the rear and anti-roll bars all-round. The front sub-frame extends around the perimeter of the lower engine bay. It is both light and stiff and is attached to the main body structure by six elastomer bushes, helping to further isolate the body from the effects of road shocks. The pressed steel lower wishbones have widely-spaced pivots that apply toe-correcting geometry for a self-stabilizing effect when braking on road surfaces with varying degrees of grip. The upper MacPherson strut mounts are also ‘de-coupled’ in order to separate spring and damper load paths into the front structure, again improving insulation from road shocks and allowing better control of ride characteristics. The coil springs are offset to reduce bending loads in the shock absorbers for more refined ride comfort. For the new Saab 9-5, body roll angles are reduced to achieve sportier handling by fitting a thicker, 21mm diameter, front anti-roll bar, the same as used in the sport suspension. This is mounted in-board on the rearmost bushes of the sub-frame, which are now 40 per cent stiffer, giving the anti-roll bar a more directly linked action, as well as contributing to improved steering feel and feedback. The front shock absorbers also have 15 per cent more damping power, further assisting body control. Redesigned bump stops, using a five unit higher density material, now help to absorb bigger bumps more smoothly. Overall, the front suspension is less sensitive to road-induced disturbances and vibration levels are reduced still further. The two transverse links on each side pivot on cylindrical bushes mounted on the sub-frame, while the trailing arm is attached to the body through voided bushes mounted in rigid brackets. The vertical spacing of the ball joint pivots on the wheel hub assembly is wider than the spacing at the inboard end in order to control wheel camber on bump and rebound. In the new 9-5, equal attention was paid to fine tuning this arrangement for improved body control. While the overall layout remains unaltered, the shock absorbers now have 15 per cent more damping capacity for both body styles and the 17mm anti-roll bar is 1 millimeter thicker. To maintain ride comfort, the rear spring rates on the sedan are 7 per cent softer, while the SportCombi retains its previous settings in view of higher potential loads. For more predictable on-the-limit handling, toe-in at the rear wheels has been reduced to 0.34 degrees from 0.42 degrees and the bump stops now have five units less density, resulting in a more progressive force build up. The more focused, sporty dynamics of the sport chassis are also improved. It retains a 10mm lower ride height than the standard chassis, while damping forces front and rear are increased by 10 per cent and the front springs stiffened by 8 per cent. Tire widths are also increased by 10 mm , to 235/45-17 on 7.5- 17 inch rims, for improved ride and steering. The hydraulic power-assisted rack and pinion steering is mounted low at the rear of the front sub-frame. It therefore provides precise wheel control, giving a good steering response and feel. In the new 9-5, re-calibration of the power steering valves, in combination with the front suspension changes, gives even more steering precision and responsiveness. The diagonally-split braking system consists of ventilated 288 mm discs at the front and solid 286 mm discs at the rear. A twin 7/8″ booster reduces pedal effort and provides a sensitive, progressive braking feel. An Anti-lock Braking System (ABS), Electronic Brakeforce Distribution (EBD), a switchable electronic Traction Control System (TCS) and a Saab-developed electronic stability program (ESP®) are fitted as standard to all variants of the new 9-5. The ABS system incorporates wheel sensors so that when any wheel begins to lock, brake pressure is diverted from that wheel to a supplementary low pressure hydraulic reservoir. When the wheel accelerates back to near vehicle speed, brake pressure is then restored. The system can cycle in this way up to 12 times a second so the wheel keeps rotating at the point of locking, allowing the driver to maintain steering control while stopping in the shortest possible distance. EBD comes into effect under hard braking before the ABS is activated, balancing the braking force between the front and rear axle. It automatically provides optimal brake force distribution, given the weight of the vehicle and the prevailing road conditions. The system is managed by the integrated ESP® controller, which compares rear wheel slippage to that at the front as a reference point. As soon as significant differences are detected, pressure to the rear hydraulic system is modulated to provide the best balance. TCS works in conjunction with the engine management system to prevent the driven wheels from spinning if tire grip is lost under acceleration. The system utilizes the ABS wheel sensors to detect wheel slip and operates the front brakes individually, to transfer torque to the wheel with the most available friction. If both wheels spin together, it also signals the engine management system to reduce engine torque by over-riding the electronic throttle. A warning light on the instrument panel illuminates when the traction control is operating, to warn the driver of slippery roads. The TCS system is fully automatic in operation, but includes a canceling switch for special driving conditions which can only be used at low speeds, below 37 mph. The electronic stability program (ESP®), standard throughout the new 9-5 range, is one of the most sophisticated and ‘intelligent’ systems on the market, able to act according to different surface grip conditions. The system is completely integrated with the ABS, TCS and EBD functions. Using Saab-developed software, it is programmed to execute whatever actions are necessary to help prevent the onset of a loss of control. In addition to the wheel speed sensors from the ABS system it incorporates a yaw rate sensor, a lateral acceleration sensor and a steering angle sensor. By constantly monitoring and comparing these parameters to a theoretical vehicle dynamics model, the system is designed to assist the driver in helping the chassis to follow the direction of steering. For example, if there is less grip than expected when cornering, there may be an oversteering slide as the tail of the car starts to move out. The ESP ® system will then momentarily brake the outer wheels, as necessary, to correct the yaw rate and gently bring the back of the car into line. In the same way, if the nose of the car starts to understeer and push wide, instead of following its intended path, appropriate braking to the inner wheels is applied to bring the car gently back into line. The automatic operation of the system is intended to complement the driver at the wheel, rather than aggressively offer help at the last available moment. A canceling switch, operative at speeds below 37 mph, is included for special driving conditions. Bold frontal styling, new front and rear light units, clean external surfaces and a more purposeful stance visually distinguish the new Saab 9-5 Sedan and SportCombi range. Inside, the new look is matched by a sporty, black interior with enhanced trim, including the seats, door panels, the steering wheel and a revised dashboard layout with new instruments. Overall, the sportier visual impact of the new range is designed to reflect the engineering enhancements to its powertrain and chassis dynamics. The new 9-5 range previews the look of future Saab models by adopting the most dramatic change in frontal design since the classic Saab 900 was launched in 1979. In locating the headlights in the outer two elements of the traditional ‘three-port’ Saab grille, the new 9-5 adopts a theme first seen on the Saab 9X concept car. The new look features all-new bodywork forward of the A-pillars. The grille and headlamp/indicator units are now separately framed by chrome trim, which extends on to the front edge of the hood. The grille also features a slim horizontal bar, representing an aircraft wing in recognition of Saab’s aviation heritage. The round, projector style headlamps, set in a matte black housing, combine to give the car a more modern and purposeful persona. A five-mm increase in the rear track for both the sedan and wagon contributes to an even sleeker, sportier stance. This is emphasized by the introduction of new, slimmer front and rear bumper moldings, which are now completely color-keyed following the removal of black rubbing strips. Three cut-outs in the front bumper molding mirror the grille and headlamp units above, the central element featuring horizontal black bars and the outer parts having black mesh inserts and fog lights. Other Saab signature features, such as the clamshell hood and the shape of the front indicator housings, are retained. The wedge-shaped profile, with a rising belt-line on both sedan and SportCombi that culminates in the ‘hockey stick’ curvature of the ‘C’ pillar, is now further emphasized by color-keyed door handles and side body moldings. The sill-line is visually extended by both front and rear bumper moldings where they blend into the wheel arches. Again, the changes are designed to give a cleaner, sportier and more integrated appearance. At the rear, new tail-light clusters with all-red lenses add to the crisper styling. On both the sedan and wagon, the new bumper molding sweeps up into the light housings, as seen on the Saab 9-3 range. The sedan retains a subtle lip in the rear edge of the trunk lid for improved airflow, while the distinctive ‘wraparound’ rear window glazing and steeply raked screen distinguish the SportCombi. Both models have excellent aerodynamics for good stability and low wind resistance. Drag co-efficients of 0.29 for the sedan and 0.31 for the wagon are extremely competitive for the class. The spacious cabin of the new Saab 9-5 offers a command-focused driving position and exceptional standards of comfort for all occupants. The soft curves, with fluid ‘organic’ shapes and forms, complement the exterior styling. The 2006 9-5 features the introduction of a ‘Black Room’ theme, which gives the interior a sporty, more modern ambience. The carpets, the main fascia molding, the ‘B’-pillar trim, all door cappings and lower storage bins are presented in black, while the headlining and ‘A’ and ‘C’ pillar trims are in contrasting parchment. The cockpit-like main instrument panel curves around driver and down towards the ignition key, handbrake and electric window controls, all located between the front seats and ahead of central arm-rest/storage box. The scalloped door panels and sweeping curves of the interior upholstery echo the shape of the fascia. The quality of materials and their fit and finish is everything you would expect in a car of this class. For the driver, the Saab 9-5 now features new white-on-black dials set in chrome surrounds within the main instrument display, which has a recessed inner edge give a three-dimensional look. The new three-spoke sports steering wheels are adjustable for both height and reach. The main console now has separate control panels for the infotainment system and automatic air conditioning, the latter adopting rotary controls. This significantly reduces the proliferation of buttons and contributes to the cleaner, fresher look. The door panels now have a new décor trim, similar in style to the 9-3 model and co-coordinated for color with the main instrument panel. The interior door handles are now presented in matte chrome. The new 9-5 maintains a Saab tradition for widely-acclaimed seating comfort. The front seats provide good back and under thigh support for both cross-country trips and long motorway journeys. 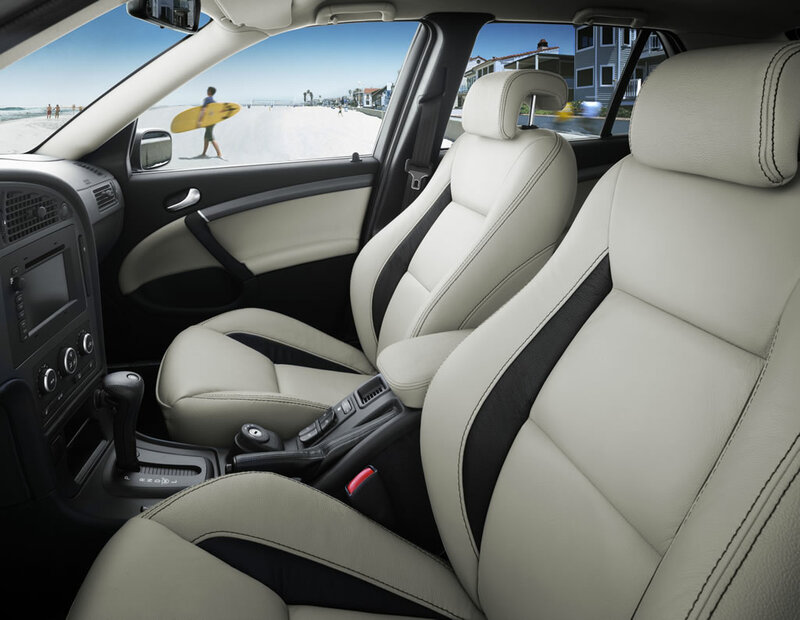 The upholstery is soft for good comfort, but firm enough to support occupants securely. High quality trim materials, in textile weave or leather, combine comfort with good wear resistance. Ventilated front seats are available as an option, as well as standard heating for all main seating positions. The front seats are also fitted with Saab Active Head Restraints (SAHR), a unique Saab-developed safety feature that helps automatically reduce the risk of neck injury in a rear-end collision (see Safety Section). The new Saab 9-5 benefits from extremely low interior noise levels. This has been achieved through the excellent aerodynamics of the body, its fine structural properties and the scientific application of sound deadening materials and special door seals. Almost all unwanted noise, vibration and harshness are attenuated by the design of the engine and suspension mountings. Porous sound absorbent pads are applied to the engine compartment bulkhead, hood, floor and wheel housings before the body is painted. Extra sound insulating materials are also applied to all sheet-metal surfaces that might be susceptible to vibration. To minimise interior road and wind noise triple rubber seals are fitted to the upper door frames and double seals lower down. All are tubular in section to ensure they function consistently, irrespective of any differences in air pressure inside or outside of the car. The SportCombi is designed to offer occupants the same level of comfort as the sedan, despite the open load area behind the rear seats which can be prone to resonance or ‘booming’. This has been achieved by careful attenuation of noise and vibration at the rear, as well as the use of a substantial, foldable rear parcel shelf. A total of seven vents are provided in the cabin, three for the driver, two for the front passenger and two for rear passengers in the back of the centre console. For optimized defroster/demister control, there are two outlets on each side of the fascia, one directed to the middle and the other to the lower part of the windscreen. Four dedicated demister vents are also provided on the fascia and in the B-pillars, one immediately ahead of each side window. Computational fluid dynamics (CFD), including the study of 1.2 million ‘cells’ representing the passenger cabin, were used to optimize the system’s performance. The complex motion of gases, lubricants and coolants inside the engine, is taken into account as well the prediction of aerodynamic flow patterns and pressure gradients over internal surfaces. Green-tinted, heat-absorbent glass is standard. It prevents about 50 per cent of the sun’s thermal radiation entering the cabin, reducing the energy required to drive the air conditioning system. The Saab 9-5 uses a combined electrostatically-charged and carbon filter which removes airborne particles as small as 4 microns ( 0.004 mm ) in size. It collects dust, soot and pollen, as well as small droplets of oil which can contribute to that greasy haze that often forms on the inside of car windows. Double front sun visors are yet another standard feature on the 2006 Saab 9-5. The first hinged flap in front of the driver or front passenger can be unclipped and swiveled to shield the upper side window, while a second hinged flap can then be lowered to cover the top of the windscreen. This feature makes driving into a low sun, particularly on a winding road, much less distracting. There are a number of useful storage locations inside the passenger cabin. Conventional pockets in the lower trim panels of the doors are supplemented by stowage pouches on the front edge of both front seats, a net pocket in the front passenger footwell, map pockets in the front seat-backs and cubby holes in both the front and rear center armrests. The generously-sized glove box is linked to the air conditioning to provide a cool environment at around the temperature of a domestic refrigerator (43F°/6°C). It is ideal for stowing chocolate or a cold drink. Four cup-holders are provided. One is elegantly designed to fold out from a slot in the instrument panel adjacent to the driver, cleverly twisting to form a horizontal support ring. Another can be deployed in the storage box below the front arm-rest, while two more are under the padded lid of the folding rear center armrest. Versatility has always been part of the multi-dynamic appeal of the Saab brand and both the 9-5 Sedan and, of course the SportCombi, offer considerable scope for carrying loads. In the sedan, either or both sections of the 60/40 split-fold rear seat-back can be folded down so the trunk can accept objects up to 65 inches (1655 mm) long. To facilitate this process, the adjustable rear head restraints can be folded flat on their mountings. There is also a ski hatch behind the folding center armrest. The SportCombi offers extremely adaptable load-carrying configurations that are easy and safe to use. Attention to detail is characterised by the design of the tailgate. Careful counter-balancing makes it light and almost ‘weightless’ to raise and lower. It also opens extremely high, arcing up through 91 ° , to 73 inches (1865 mm) in height, allowing tall people to stand under it without banging their heads. The gas struts are integrated into the hinges, helping to keep the loading area as clear and uncluttered as possible. While load-carrying should be easy and convenient, it must also be safe. And here the SportCombi features Saab’s innovative Cargo Tracks, an example of technology crossover from the aircraft industry. The two floor-mounted aluminium rails extend longitudinally down either side of the load area (in aircraft they are used to position and secure seats or cargo) and provide one of the best load-securing systems on the market in terms of safety, flexibility and user-friendliness. Four spring-loaded attachments snap into the tracks and can easily be moved between three positions on each track. Fitting two either side offers a strong foundation for securing cargo in conjunction with the load straps or an elastic net, both provided as accessories. 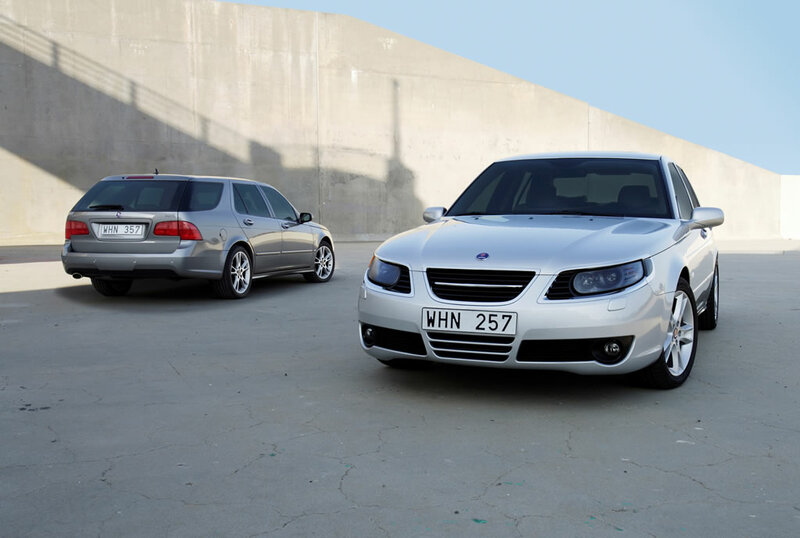 The new Saab 9-5 Sedan and SportCombi are clear expressions of the sporty and multi-dynamic appeal of the Saab brand. They provide individual, expressive choices in a marketplace crowded with more commonplace competitors. A new ‘Black Room’ theme is introduced for 2006, which gives the 9-5’s interior a sportier, more modern ambience. The carpets, the main fascia molding, the ‘B’-pillar trim, door trim and lower storage bins are always presented in black, while the headlining, rear parcel shelf and ‘A’ and ‘C’ pillar trims are in contrasting parchment. 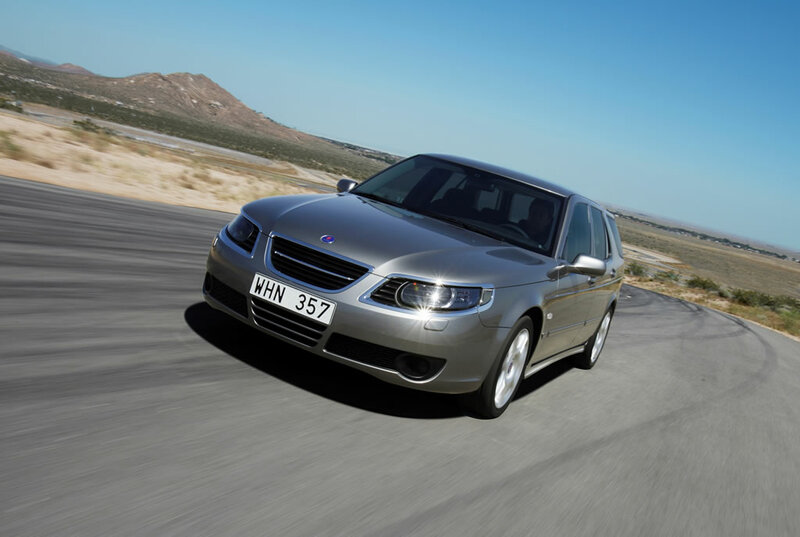 The ultimate expression of Saab turbocharged performance, 2006 9-5 models are equipped with black or parchment door inserts and sport leather seats with contrasting leather panels in the cushions and seat-backs, similar to those in the 9-3 Aero. The main instrument panel and door décor trims have a dark grey, ‘tinted metallic,’ semi-matte finish. The sport steering wheel now has distinctive matt chrome inserts in the leather rim, a design inspired by the control column of an aircraft, which hints at Saab’s aviation heritage. On the exterior, the 2006 9-5 Aero models are distinguished by standard color-keyed sills, side body moldings and door handles. Seventeen-inch alloy wheels with a unique, ‘twin’ five-spoke design and all-season tires are fitted. The 2006 9-5 offers a new audio system that includes MP3 compatibility, XM Satellite Radio and an in-dash 6-disc CD changer. Messages and trip computer data are shown in the central instrument display. The main functions can also be controlled via steering wheel-mounted buttons. The system has been carefully tailored to match the different interior acoustic characteristics of the Sedan and SportCombi and uses an antenna integrated into the rear screen. It supports an MP3 player through an auxiliary input socket and has CD playback compatibility. ‘Speed sensitive’ volume increases or decreases automatically to compensate for changes in ambient noise levels at different road speeds. Radio frequency, station identity, program and CD information are shown in the new head unit display, which also houses the CD changer. The 200-watt Harman Kardon system produces outstanding ‘concert hall’ sound through a total of nine speakers, including two sub-woofers for the sedan and eight speakers, including a single sub-woofer, for the SportCombi. To help minimize potential driver distraction, the 9-5’s Saab ComSense driver safety function includes the use of a ‘dynamic workload manager’. This enables the brief suppression of dashboard warning messages, or the interception of an incoming call on the telephone, when a moment of high driver workload is detected through the operation of the indicators or during heavy braking. In the same way, the Night Panel function also allows the driver to minimize distraction by switching off, or dimming, all the main instrumentation illumination at night (except for the speedometer). Information important to the operation of the vehicle, such as very high engine revs or a low fuel level is then illuminated on a ‘need to know’ basis. The development of steering wheel controls is a further means of helping to keep the driver’s attention on the road. Available five-speed automatic transmission includes Saab Sentronic manual gear selection via steering wheel buttons. 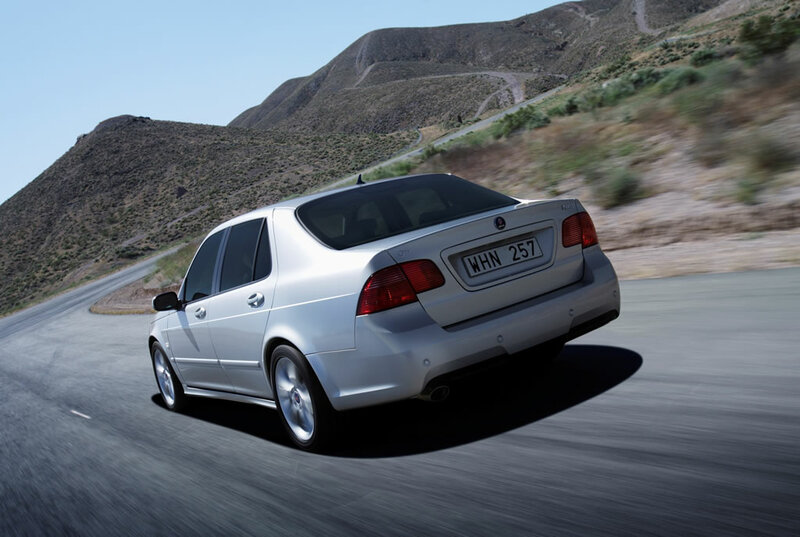 The new 9-5’s turbo powertrain is the most powerful production engine ever offered by Saab. It delivers characteristically strong low and mid-range torque for swift acceleration and safe overtaking. The choice of engines in the new 9-5 is greatly simplified for 2006 with a single 2.3-liter turbocharged 4-cylinder with 260 hp/191 kW. It features four valves per cylinder, double overhead camshafts and counter-rotating balancer shafts for exceptional refinement. The engine delivers responsive turbocharged performance to match the new 9-5’s enhanced chassis dynamics, maintaining a Saab tradition in offering outstanding levels of torque, or pulling power. Unlike naturally-aspirated engines of similar power, it is not necessary to maintain high revolutions for strong performance because turbocharging ensures exceptional torque is readily available between 2,000 – 4,000 rpm, the engine speeds used in everyday driving. This is why the Saab 9-5 engine is characterized by an exceptionally flat torque ‘curve,’ frequently likened to the distinctive profile of Ayers Rock in Australia ! It is fitted with the Saab Trionic 7 electronic engine management system, developed in-house. It simultaneously controls the ignition timing, fuel injection, turbo boost pressure and the electronic throttle, eliminating the need for a distributor, central coil and separate spark plug leads. The new 9-5’s position at the top of Saab’s passenger car range is underlined by a 10 bhp/7 kW increase in the 260 bhp/191 kW maximum output of its 2.3-liter turbocharged engine. Torque is maintained at an exceptionally strong 258 lb.-ft. (350 Nm) between 1,900 and 4,000 rpm. The capacity of the 32-bit Trionic engine management system enables the programming of a unique ‘superboost’ facility on engines with manual transmission, raising torque still higher, to 273 lb.-ft. (370 Nm), for up to 20 seconds. This feature is automatically engaged at full throttle openings for even swifter overtaking. On the road, this level of power gives the new 9-5 in Sedan or SportCombi form searing acceleration. The zero to 62 mph (100 kph) dash is accomplished in just 6.9 seconds (7.3 for the SportCombi). The engine has an aluminum alloy cylinder head, chain-driven camshafts and a cast-iron block with a 90 mm bore, half-siamesed cylinders and five main bearings. Special jets spray cooling engine oil to the underside of the pistons at the bottom of their stroke, a feature more commonly seen in competition engines. Convenience and sporty performance are combined in the sophisticated five-speed automatic transmission, which also incorporates Saab Sentronic manual gear selection via steering wheel buttons. Manufactured by Aisin AW, this optional transmission constantly monitors its surroundings, adapting shift patterns to the prevailing conditions. For example, it can detect changes in altitude and engine performance, or if a trailer is being towed, and will optimizes its gear shifting patterns accordingly, staying within the engines ‘sweet spot.’ This is facilitated by a high-speed databus connection which provides a continuous flow of information between the Trionic engine management system and the automatic transmission’s control module. In addition to selecting ‘normal‘ or ‘sport’ modes, the driver can also enjoy close gear changing control akin to that of a manual transmission by using Saab Sentronic steering wheel buttons. With the selector lever in the ‘M’ for manual position, swift sequential changes can be executed via the buttons – the right one for ‘up’ changes and the left for ‘down’ changes. Saab leads the premium segment in fitting the new 9-5 in Sweden with a 2.0t BioPower engine fuelled by ethanol, a ‘carbon-neutral,’ renewable energy source. Not only kinder to the environment, this engine also produces more power and performance when compared to its gasoline-only equivalent. In combining the benefits of ‘going green’ with the enjoyment of even sportier performance, the development of BioPower is typical of Saab’s inherent brand values. The engine also offers a very practical solution to the environmental needs of customers because it can also run on gasoline, without adjustment from the driver, in any proportion if ethanol-based fuel is not available. There is no loss of luggage space because the same standard tank is used for both fuels. Ethanol is produced commercially from agricultural crops or forest residues. Unlike gasoline, which is produced from oil, its consumption does not raise atmospheric levels of carbon dioxide (CO 2), the ‘greenhouse’ gas that contributes to global warming. This is because emissions during driving are balanced by the amount of CO 2 that is removed from the atmosphere when crops for conversion are grown. Running on E85 fuel (the 85 percent ethanol/15 percent gasoline blend found in Sweden and other emerging markets), the Saab 9-5 2.0t BioPower engine delivers 180 bhp/132 kW and 280 Nm of torque, compared to 150 bhp/110 kW and 240 Nm when using gasoline. The significant 20 per cent increase in maximum power and 16 per cent gain in torque give even sportier performance. In the Saab 9-5 sedan, this translates to zero to 62 mph in just 8.5 seconds and 50-75 mph in fifth gear in 12.6 seconds, compared to 9.8 and 14.9 seconds running on gasoline. E85 fuel has a much higher octane rating (104 RON) than gasoline and is ideally suited to turbocharged engines. The adaptability of Saab’s powerful Trionic engine management system has facilitated re-programming to accommodate the different ignition timing and fuel/air mixture requirements of E85 fuel. Trionic continuously monitors, detects and makes any adjustments necessary for the use of E85 or gasoline in any combination. Initially available in the new 9-5 sedan and wagon with manual transmission only (automatic versions to be available early next year), BioPower is being successfully introduced in Sweden where an E85 infrastructure is fast developing. Other international markets are expected to follow. Front-wheel-drive, transversely installed, hydraulic engine mountings. 2290 cc. 4 cylinders in-line. cast iron block, alloy cylinder head. Turbocharged, intercooled. DOHC, 16-valve. Twin balancer shafts. Saab Trionic 7 engine management. Direct ignition, multi-point fuel injection. 1985 cc. 4 cylinders in-line. cast iron block, alloy cylinder head. Turbocharged, intercooled. DOHC, 16-valve. twin balancer shafts. Saab Trionic 7 engine management. Direct ignition, multi-point fuel injection. 5-speed manual gearbox with single dry-plate clutch, diaphragm spring. 5-speed automatic transmission with direct mechanical lock-up in third, fourth and fifth gears. Saab Sentronic selection via steering wheel buttons. Rear: Independent, multi link, one longitudinal and two transverse. Coil over twin tube shock absorbers. Anti-roll bar. Isolated subframe. Hydraulic, dual circuit, 9” tandem vacuum booster. 60/40 split. Removable rear seat. Max. roof load: 220 lbs.